Sarah (Mimi Lieber, L) and Rifkele (Adina Verson, C) cowering before Yankl (Tom Nelis) in the closing moments of God of Vengeance. Photo © Carol Rosegg, 2015. Paula Vogel’s drama Indecent premiered at the Yale Repertory Theatre in New Haven, Connecticut, in October, and then moved to the La Jolla Playhouse in San Diego, where it just completed its run. Next spring, it will be staged at the Vineyard Theatre in New York City. The play revolves around the creation and production history—some real, some invented—of Sholem Asch’s Got fun nekome (God of Vengeance), one of the most frequently performed, and also most controversial, works in the history of the Yiddish stage. In Asch’s drama, brothel owner Yankl Tshaptshovitsh and his wife Sarah try in vain to protect their teenage daughter Rifkele from their own profession by commissioning the creation of a Torah scroll, which they plan to keep in her bedroom as a kind of talisman until she marries a “kosher,” or respectable, Jewish boy. In one of the drama’s most remarkable scenes, Rifkele passionately kisses Manke, a prostitute from the brothel, while having a conversation about her prospective bridegroom with Sarah, who is speaking to her from another room. Responses to Asch’s play were largely positive, in productions across Europe and in New York. In 1923, however, when an English-language version of God of Vengeance was produced on Broadway, producer Harry Weinberger and the twelve-member cast were arrested and charged with “unlawfully advertising, giving, presenting, and participating in an obscene, indecent, immoral, and impure drama or play.” They were fined $200, but ultimately had the conviction overturned on appeal. The cast of Indecent. Photo © Carol Rosegg, 2015. Paula Vogel uses the embattled Broadway production as one of several linchpins of her new play, which also reimagines the creative process that led Asch to write the play in the first place, the fate of Yiddish culture in the Holocaust, and controversies over Asch’s fictional work in the 1930s and 1940s. 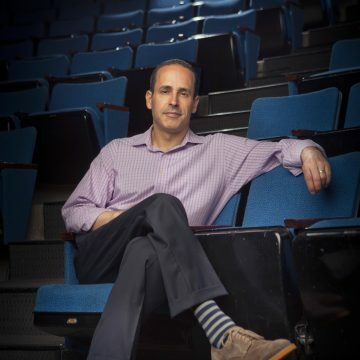 The DYTP’s Joel Berkowitz, who served as the Yiddish Consultant for the Yale Rep and La Jolla productions, spoke to the playwright and director about Asch, God of Vengeance, and Indecent. Joel Berkowitz: Both of you have been working on Sholem Asch and God of Vengeance for a very long time. Why have this playwright and this play had such a strong hold on you? Rebecca Taichman: God of Vengeance is an extraordinary play. It took my breath away when I read it for the first time in 1997 and I have been obsessed with it since. There is much to love: the metaphoric use of space – the upstairs/downstairs, the sheer beauty of the love scene, Asch’s compassion for prostitutes, his critique of hypocritical piety… Of course, I am also captivated by life of the play, and how it is a fascinating lens through which to view a large swath of Jewish history. Paula Vogel: The reason the script has been indelible for me is that when I read it, as a 23 year old feminist, I was struck by the sensitivity and understanding that Asch had for his women characters. And by his understanding as well of the fraught issues of class, patriarchy, and gender in his playworld that seemed prescient. JB: Many features of the story you tell in Indecent have changed as the play and production evolved. What are some of the most important changes, and why were they made? RT: Theatre is full of surprises. What you think works on the page doesn’t always work when it becomes manifest. The process of making a new play usually involves constant change and growth. Paula and I have been working on Indecent for so long now, the entire process feels more like a progression or organic evolution rather than a series of changes. The play is still coming into being. PV: I am guided in this play by one ruling passion: how do we seduce the audience to love the play, The God of Vengeance, and impart a desire to know the text? I have always said that in many ways I see Indecent as product placement. Since I cannot know the actual historical people, I am guided by the question of how I create character recipes, as the theatre theorist Bert States would say, that creates a longing and a mourning for the theatre and people we have lost. JB: Rebecca, you’re a director with a long list of major productions to your credit, but you told me recently that staging Indecent has presented challenges you’ve never faced before. What are some of those challenges, and what solutions have you come up with to address them? RT: Because the world of the play changes completely every few pages, we really had to reinvent over and over and over again. I often found that trying to work purely on logic was not that useful, but that instinct was my best friend on this one. Trusting that I knew the play and the moment-to-moment truth of it so well that my intuition would kick in was usually where I found the most exciting answers. I found myself often saying to the company of actors: “Just try this. If it works, we will figure out why–but I can’t logically explain it…” Luckily the company would leap in and from intuition I was able to eventually codify, organize, explain. Indecent has so many layers playing out simultaneously. It felt sometimes like spinning plates–look away for one second and the whole thing could collapse. Richard Topol as Lemml, who falls in love with God of Vengeance at its first reading and becomes its lifelong stage manager. With Tom Nelis as actor Rudolph Schildkraut. JB: I don’t think anyone would categorize Indecent as a musical, but it contains quite a few songs (English, Yiddish, and German), the musicians are part of the cast and on stage much of the time, and choreography is important to the production as well. Tell me about the process of selecting and staging those songs, and what music and dance mean to the play. PV: I chose the songs after 2-3 years of research, and wonderful, wonderful song tracks on my iTunes. I wanted to select songs that would not forward the plot (which is why it is not a musical) but frame and alienate our story. I always thought the play should have musicians, a three-piece klezmer band, with a violin, accordion, and clarinet. There is a way, of course, to produce the play with recorded music. RT: Paula and I listened to music as we created the piece, and that soundtrack became many of the songs you now hear in Indecent. I cannot imagine the play without music. The songs move the play through time as it hurtles forward various blinks in time…We’re in a cabaret in Berlin in 1908–a blink in time: we’re in 1923 on Broadway–a blink in time: we’re in Lodz 1938–another blink: we’re in 1952 Connecticut. Music seemed the best way to feel those blinks. JB: This is a play in English, but with a great deal of Yiddish in it. There’s the occasional Yiddish word in the dialogue, lyrics of entire songs, and a significant amount of Yiddish text that we never hear, but that gets projected onto the stage. How do you tell a story about a Yiddish play to an audience that for the most part does not understand Yiddish? PV: That is the challenge, isn’t it? But I don’t know how to read or write Yiddish, so that was a benefit. This is perhaps the most challenging play I’ve written. We are asking audience members if the concept of the dialects work, and I’m relieved that it does. Hopefully Indecent creates a longing to read Yiddish. Adina Verson (Rifkele) and Katrina Lenk (Manke). Photo © Carol Rosegg, 2015. RT: It is a great question, and was not easy to figure out. It was Paula’s idea to using dialect and accent to make when people are speaking Yiddish or English. The logic is that if a character speaks their native tongue they have no accent. If they speak a language they are not comfortable with, they get a heavier dialect. It seems to work well. JB: Indecent takes us on an epic journey, from Warsaw in 1907 to the United States in the 1950s, and to other parts of Europe and America at various times in between. If you could travel back in time to see just one of the productions of God of Vengeance featured in the play, which one would it be, and why? PV: I would love to go to the Bowery Theatre to see Schildkraut and watch an audience respond and react to a great Yiddish play. I would love to leave the theatre and walk through the streets, go to the nearest café, and hear the conversation. And I would also love to wait by the stage door, and thank the actors as they left—and hopefully get my program signed! Berkowitz, Joel . “Interview: Indecent Playwright Paula Vogel and Director Rebecca Taichman.” Digital Yiddish Theatre Project (December 2015): Accessed Apr 25, 2019. Joel is Director of the Sam and Helen Stahl Center for Jewish Studies and Professor of Foreign Languages and Literature at the University of Wisconsin-Milwaukee.